I’ve never owned a pressure cooker but after reading this book and watching the Veggie Queen DVD I am ready to go to my nearest kitchen supply store and purchase one today. I love my slow cooker, but I am not very good at planning meals ahead of time. When using a slow cooker you need to know what you are putting in it early in the morning or the evening before. If you are using a pressure cooker you can plan your meal five minutes before you cook it and cooking time is reduced to 30 minutes or less. This sounds like my kind of cooking! In “The New Fast Food,” Jill Nussinow shares 150 of her favorite vegetarian recipes all of them prepared in a pressure cooker. Whether you are a frequent pressure cooker user or have never owned one like myself, you will learn more about the benefits of using your pressure cooker in “The New Fast Food.” This book provides information about how to use your pressure cooker, what cooking times are best for the type of food you are cooking, and how to avoid a messy kitchen with only one pot to clean. For more information about Jill Nussinow and The Veggie Queen visit theveggiequeen.com. 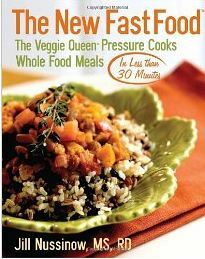 “The New Fast Food, The Veggie Queen Pressure Cooks Whole Food Meals in Less Than 30 Minutes”, is available to purchase on Amazon.com or at your local bookstore. *Disclosure: I received a copy of “The New Fast Food, The Veggie Queen Pressure Cooks Whole Food Meals in Less Than 30 Minutes” and the DVD, “The Veggie Queen Pressure Cooking: A Fresh Look Delicious Dishes in Minutes,” in exchange for this review. All opinions are accurate and 100% mine.